Update: AIR has estimated insured losses from the quake at up to $2.9 billion. 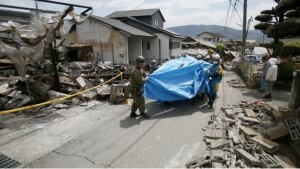 Damage is still being assessed both in the Kumamoto region of Japan’s Kyushu island, where earthquakes struck at magnitude 6.1 on Thursday and magnitude 7.1 on Saturday of last week causing extensive damage to property and infrastructure, as well as in Ecuador where a magnitude 7.8 quake on Saturday also caused widespread devastation. As a result of the earthquakes, analysts at investment banking firm Morgan Stanley explained that the perception of catastrophe risks in the insurance and reinsurance industry could be heightened, helping to further moderate pricing at the upcoming mid-year reinsurance renewals. The analysts say that, while still too early for any meaningful insurance or reinsurance industry loss estimates to come out, there is an expectation that these events could impact Q2 2016 earnings for some of the big global re/insurers. Business interruption losses in Japan could be one of the significant contributors to an industry loss, with the southern island of Kyushu home to around 25% of Japan’s semiconductor industry, as well as many other industries. There have been many reports of factories in Kyushu shutting due to the Japanese quakes, with no forecasts for when they will reopen currently. Morgan Stanley’s analysts say that events such as these “rekindle” the memory of other recent insurance and reinsurance industry losses, and increase the perception of catastrophe risks among re/insurers. This could support pricing of property catastrophe risks, the analysts suggest, saying that recent losses and higher risk perception could help to moderate price declines at the key June and July reinsurance renewals. However, with capacity for property catastrophe risks remaining abundant, there is unlikely to be any chance for reinsurers to try to significantly moderate rate declines or push for rises, as alternative capital and ILS markets are set to continue to take market shares meaning traditional reinsurers have to be extra competitive on price. There is an expectation that as well as global reinsurance firms taking losses due to these events, the Lloyd’s and London market insurance and reinsurance players will also take a share. Analysts at Peel Hunt said that Lloyd’s re/insurers will likely face losses from the Japan quakes due to commercial and industrial impacts. Residential losses, meanwhile, are likely to hit Japanese insurers with a significant amount of these losses retained and the rest passed onto global reinsurance markets. However, much of the London markets reinsurance exposure to Japan is likely to be on an excess of loss basis, which could mean more of the losses are retained at the primary level. For the insurance-linked securities (ILS) market there remains a chance of some impact to a number of ILS funds participating in global reinsurance markets on a collateralised basis, as well as to retrocession markets and also collateralised reinsurance sidecar vehicles. However, the impact to the ILS market is not expected to be particularly significant at this stage and exposed catastrophe bonds are assumed to be safe, as the level of losses from the Japanese earthquakes is not expected to get close to these cat bond attachment points. Risk modelling firm RMS provided an update on the Ecuador earthquake and highlighted the potential for insurance and reinsurance industry loss due to expected damage in a key port area of the country. Dr. Robert Muir-Wood, chief research officer at RMS, explained; “As well as the fatalities and the impact on people’s lives there is likely to be significant economic damage in Ecuador. “For the insurance industry key areas of concern will be around Esmeraldas which is a major port city just beyond the northern extent of the strong shaking. As well as facilities for international sea trade there is also the country’s largest oil refinery with a capacity of 110,000 barrels per day. At the southern end of the area of strongest shaking lies the country’s largest sea port at Manta. A short distance inland from there is Portoviejo which is the main commercial center for this region. “Right across the affected coastal areas it’s clear that construction standards are often poor. Major commercial buildings and the many seaside hotels are also likely to be of concern to the insurance industry. So there is also the prospect of losses hitting global reinsurance markets from Ecuador, which could impact certain collateralised reinsurance focused ILS markets, to a much smaller degree. These catastrophic events will impact Q2 earnings and results for some insurance and reinsurance players and with other global events such as the severe flooding in Texas and increasing U.S. severe convective storm losses likely to increase the impact to earnings as well, the pressure on profitability at reinsurers could be raised. That will definitely heighten the perception of catastrophe risk in the re/insurance and ILS markets, but whether it will truly moderate price declines remains to be seen. With capital seeking access to re/insurance risks still building, it seems likely that the June and July renewals will be characterised once more by excess capacity and not enough new demand. That could overshadow any newly raised awareness of risk, meaning the pressure on reinsurance pricing continues. – 7.8 Ecuador earthquake causes widespread severe damage.